Published the second Friday each month. You are on this list because you signed up for one of our programs. To change your subscription, see link at end of email. Sign me up for this ezine! What's your biggest hurdle when it comes to practicing forgiveness? Do you have a question about this week's article? Email it to me! I'll be answering these in upcoming issues of the Forgiveness and Freedom Ezine. Watch your inbox for your next issue. It's been almost 15 years since my mom died. 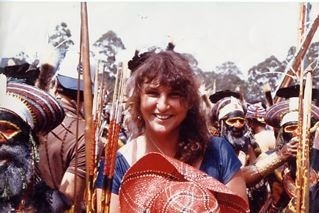 Here she is pictured at one of her most happy times-traveling among the natives in Papua New Guinea. She had a flair for the forbidden and exciting. My mother was not a rule follower-like I was back then. She was taking photos on this trip and came home renewed with a passion for life and especially for the children she met there. This Mother's Day I set an intention to honor my mom by not missing her so 'dang' much and instead, really consciously embracing all those kooky things about her that I sometimes judged when she was alive. Interesting to note is that I think she may have been the same age as I am currently here or maybe even a little younger. Wow- that takes a little getting used to. My mother's love for children was definitely passed on to me. Last month I was invited to bring 15 minutes of my one-woman show and my 3 Step Forgiveness Workshop into 2 high school classes and they really got it. Now--I'm looking for more opportunities to bring my work before more youth. Ideas for funding and schools/ programs to check into are welcome. Have an idea for collaboration? Let me know. **If you'd like to see two minutes from my autobiographical one-woman show, My Brooklyn Hamlet, check it out here. Theme: What Image Do You Hold of Yourself? This past weekend I spent 3 days in a powerful workshop called Insight. I was particularly drawn to this workshop because it was created by the founder of the master's degree program that I attended for two years and received a Spiritual Psychology degree from. The workshop was called Insight Pride and almost everyone in attendance was gay or bisexual. It was incredibly comforting and rewarding to be delving beneath the surface with people that I didn't feel I had to explain my sexuality to. And to do the workshop with my partner. Now--do I really have to explain my sexuality or is that just my self-judgment being projected onto other people? Really, how much is in my head and how much is real? Maybe people are just curious because gay people are about ten percent of the population. These are things for me to explore. Anyway, I fell in love with a woman for the first time nine years ago and we have one of the best relationships around and I am grateful. I learned about another layer of approaching guilt and resentment in my life. Some of it has to do with the images we hold of ourselves or of other people. For example: Do you have an image of yourself as someone who always keeps their word? That's not a bad thing. However, if that's your image and you're unconscious about that, then when you aren't your word you might beat yourself up disproportionately to what happened. Does that make sense? Or do you think your mother should act in a certain way---more loving? Is that based on truth and her past actions or is it based on wishful thinking and how you believe she should be? If all of these beliefs are unconscious then when she doesn't live up to the image you have of her you probably get resentful. And that hurts you. All of my coaching work is about taking the anger, resentment and shame off of you so that you can live a more peaceful and loving life. 1. Change the image you hold of your mother. I invite you to let go of any 'should's in your life. They NEVER bring peace and freedom. Perhaps you can still hold a loving image of her in your mind's eye and at the same time know that she has faults like we all do. Then next time she doesn't live up to how you want her to be you can be less condemning, have your heart be less closed down and you can feel more at peace. Want to find out how I moved out of complete judgment of my father for taking my mom's life and marrying her sister? Pick up a copy of my forgiveness guide, My Father Killed My Mother and Married My Aunt: Forgiving the Unforgivable right now. If you have any questions regarding this please drop by www.facebook.com/ForgivenessandFreedom. I pop in all the time and answer questions there when time permits in my schedule. And we have a lovely Forgiveness community there. May 11th: Check Mates Launch: A Collection of Fiction, Poetry and Artwork about Obsessive Compulsive Disorder, by People with OCD. When you order the book on Amazon on May 11th you'll receive many bonuses including my 4 part video tips series on Practical Forgiveness. My Brooklyn Hamlet at The New End Theatre in London from June 11th- June 27th. If you're in England during that time I hope you can see my show and we can meet for tea. And please feel free to pass this info along. Interested in joining this community? Email me at Brenda@forgivenessandfreedom.com during this pre-launch stage (before it opens) with your interest and your biggest forgiveness or setting healthy boundary challenge and you'll be guaranteed to receive the pre-launch membership price. My mother died in 1995. As many do after someone dies, I put her up on a pedestal. It's only now, just over fourteen years later, that I have begun to look at the affect the unhealed parts of our relationship have had on me and the unanswered questions they have left for me. Would we have resolved our issues had she lived? Would I have been able to stand forth in my own feminine power with her big personality hovering over me? Could I have forgiven my judgments of her? My mother loved me. This was never in question. She was controlling. I'm sure she thought it was for my own good. When she pushed me to go out of my comfort zone, I resented her and sometimes withdrew---thinking this made her wrong and me right somehow. But I was really hurting only myself and setting myself two steps back. When I soared past the limitations she had set for me she felt betrayed and abandoned. Such was the time when I moved to Europe instead of just traveling there for a summer the year I turned 22. After all, she was no longer the center of my world. I thought she was selfish and I am sure she thought the same of me. Now I realize that she didn't know any better. And because she didn't know any better, she couldn't do any better. Is your mother controlling? Did she try to control you in the past? What if that control is not something she's doing against you but is simply coming from a place of her own loneliness and inadequacy? Could you find compassion then? The key thing here is to know that you are not condoning her behavior or forgetting what she has done. You are filling yourself with compassion when you think about her so that you feel better inside. This also allows you to be in charge of your own life. Instead of being emotionally triggered by her demands, take a moment to take a breath so that you can transform your anger or anxiety into compassion to make healthier choices from that place of equanimity. You are in charge of your life and decisions. The sooner you take responsibility and overcome the challenges of change, the sooner you will enjoy more freedom and peace in your life. Some of the people I have worked with over the years have felt stifled by their mothers. Women felt like their mothers were in competition with them for their fathers' attention and they hated their mothers' because of it. How do you think this would affect your relationship with other women? One woman realized that she never trusted women because of this unhealed material with her mother. Imagine the freedom and love that came into her life when she stopped looking at other women through untrusting eyes. A male client told me that his mother never approved of any woman in his life, even his wife, causing disharmony and a tug of war inside him as to who should be placed first. He felt disloyal by choosing his wife over his mother at times and felt a strong draw to make his mother feel like she was always first for him. His mother had a hard time letting go as well. It is amazing how much more peaceful he became when he achieved clarity on what was really important to him. This allowed him to take responsibility for his choices and make mindful ones rather than doing things out of habit. He was able to stop blaming his mother and his wife for their demands. He made a clear decision from a centered place inside of him where he could energetically send love to everyone involved. 1. When you hate your mother, you hate a part of yourself. This may seem counter intuitive at first. You may even feel like you are protecting yourself with your anger because this is the only way you know how to keep her at a distance from you. Truth is that we live in an energetic universe and the energy that you send out comes back to you. If you crave more compassion in your life, be mindful of when you aren't feeling compassionate and change that. If you are blocked from finding compassion for what your mother did to you (or is currently doing), switch your thoughts to something you are feeling compassion for. Maybe you have a good friend who you love or a pet. My love for my dog never fails me. Continue to set compassionate and thoughtful boundaries with your mother. Limit the amount of time you see her or speak to her. Be open to the possibility that she may actually change as you stop being judgmental of her. This isn't guaranteed but it can happen. It is never too late to forgive. If your mother has passed on, it is really important for you to do this work now to alleviate any guilt that you may be living with. Guilt is poison to your spirit. 2. If you want more good/ joy/ abundance/ love in your life, then you must make a shift within yourself to eradicate anything which is counter to that positive energy. By making your mother wrong you are hanging on to judgment. Imagine what your life would be like if instead of trying to change her or living in regret or acting out, you could move on and spend your time on more positivitly. Release the negative and open the doors to your kingdom of freedom and peace where you'll be better able to meet the love of your life, enjoy time with your children and friends, take up an artistic project so you can express yourself creatively, travel to those dream destinations, see more prosperity in your business, contribute more to your community. Let me state this clearly---forgiveness is for you so you can be happier and experience more peace every day. 1. Keep a journal with you and note how many times a day negative thoughts about your mother take over your mind. The first step to healing is bringing this negative pattern of thought to your awareness. Forgive yourself for time lost, and make a commitment going forward to be kind to yourself. Today is the first day of your new life filled with freedom and peace of mind. In one week read over your journal. Note any patterns that show up. And then throw your journal out and start again. 2. In a previous article on How to Forgive Your Father's Betrayal, I laid out the tools for you to start practicing forgiveness of your judgments about yourself. I've learned that all judgments can somehow be turned back on us because as people we project our feelings and thoughts onto others. For example: If I judge my mother as mean-spirited then I need to look at where I am mean-spirited. When I'm aware and honest within myself, I can easily see that I can be mean-spirited towards myself when I don't stick to healthy choices in my self-care. By forgiving myself for the mistakes and missteps I might make in this the world, I see changes for the better. This tool also allows for your forgiveness work to be in your own hands because you are not depending on someone else to change to make things better. You can change your life by changing your patterns of thought and how they manifest in your behavior. Do this work and see the abundant freedom that comes from truly forgiving those who have betrayed you and the past wrongs you have done to yourself because of it. Want to reprint this article in your ezine or website? You may, as long as it remains intact and you include this complete blurb with it: Brenda Adelman, MA in Spiritual Psychology, referred to as The Queen of Forgiveness, teaches people who have a lot to offer but are stuck, how to become present, enjoy more success and peace in their relationships and lives by letting go of old and new resentments using the art of forgiveness. For FR*EE tips on how to finally be happy and free visit www.forgivenessandfreedom.com. 1. Would you like to find out the exact steps I took to heal from my father's betrayal and the loss of my mom? I went from being depressed, barely able to get out of the house and unable to trust anyone to the positive, happy and peaceful woman that I am today using the tools and exercises I've written in this book. And I've been in the best love relationship of my life for the past nine years. My Father Killed My Mother and Married My Aunt: Forgiving the Unforgivable. Available as an ebook only at www.forgiveandbefreebook.com. For a very limited time I'm also bundling the ebook with a powerful 60-minute Setting Healthy Boundaries MP3. You'll receive this audio download as my gift when you purchase my forgiveness guide at www.forgiveandbefreebook.com. In the almost 4 hours of audio classes in this program you'll learn how to feel safe and how to honor yourself in business and personal situations. --> Find all the details here - Don't wait another moment! Last month she sent out a wonderful article on the reasons we should give up sugar for our health and vitality. She sends free tips out weekly. We grow by "word-of-email" so please feel free to forward this to anyone whom you think might benefit from and enjoy it. Thanks so much!